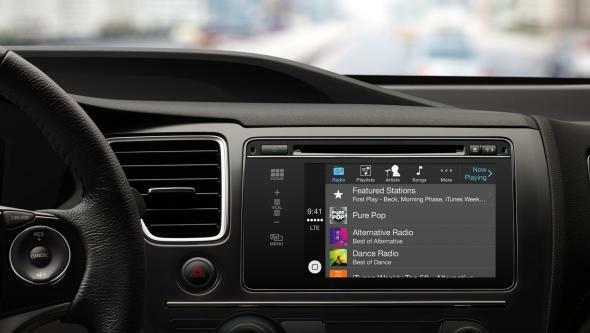 Apple launches CarPlay, iOS for the car, as smartphone wars move to dashboard. Apple’s new CarPlay home screen. What kind of car do you drive—Android or iOS? We’re not quite there yet, but it’s looking increasingly likely that your ride will be among the next big battlegrounds in the smartphone wars. Apple announced Monday that it’s rolling out CarPlay—formerly known as “iOS in the Car”—for three manufacturers this week: Ferrari, Mercedes-Benz, and Volvo. Thirteen other manufacturers, including some less hoity-toity ones like Honda and Kia, are slated to follow suit eventually. And here are some of the music options, which feature Apple’s iTunes Radio but also support certain third-party apps, including Spotify and iHeartRadio. So far, Pandora is not among them, though the company told the Mercury News’ Jeremy Owens it isn’t ruling out the possibility of a partnership at some point in the future. iTunes Radio is the default music option. Oh, and I hope you like Apple Maps, because that other company’s maps are not an option in your iCar. Apple Maps is your only choice for navigation. Speaking of that other company, Google has its own designs on your dashboard. Last month it announced the formation of a consortium called the Open Automotive Alliance, which includes GM, Honda, Audi,* Hyundai, and Nvidia. The Verge reported in January that the first Android cars are expected to launch by year’s end. Ford, meanwhile, had been working with Microsoft in a marriage of industry old-timers. But rumors are that it got fed up and dropped the Redmond giant in favor of—wait for it—BlackBerry! However, Ford is also listed among the likely future partners for Apple’s CarPlay software, so perhaps it is hedging its bets. Electric-car pioneer Tesla has gone a different route, developing its own, Linux-based in-car operating system, which is already in use in the company’s Model S sedans. It will be interesting to see whether the in-car tech market mirrors the smartphone market, with Apple dominating the high end and Android controlling the middle. One big difference is that, short of buying its own car company, Apple has no choice but to work with third-party hardware in the automotive realm. Still, similar dynamics could emerge if Apple turns out to be more bent on controlling the in-car software experience than Google is. That would limit the quantity of its partnerships while theoretically assuring their quality. On the other hand, Google has a chance to tilt the tables by building superior software in the realms most relevant to drivers, including maps and voice-activated search and personal-assistant tools. 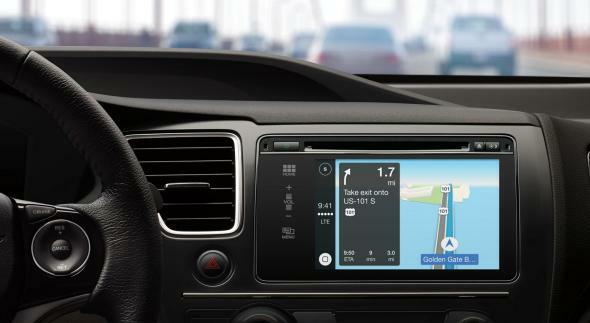 Google Maps vs. Apple Maps and Siri vs. Google Now were already important battles in the mobile software world, but they might be even more crucial when you have two hands on the wheel. In not entirely unrelated news, Microsoft today announced its own Siri rival, called Cortana. *Correction, March 4: This article originally misspelled the name of the automaker Audi.